I believe in eating seasonally so from mid-November to just before Christmas that means munching down a whole lot of Trader Joe’s Candy Cane Joe-Joe’s. 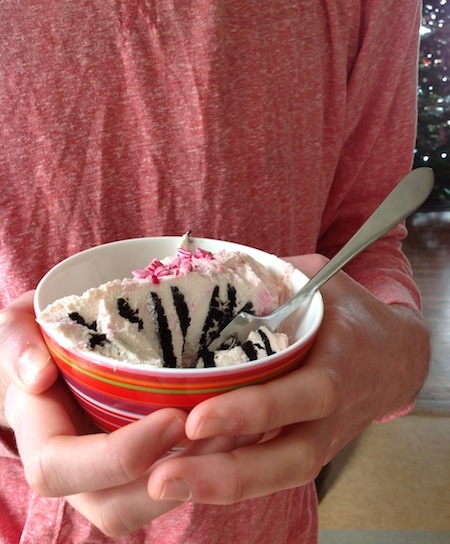 If you’ve never had a CCJJ imagine this – an Oreo cookie that has crushed candy cane bits mushed into the creamy filling. That my friends, is a candy cane joe-joe and they are only available from just before turkey day to a couple of weeks before Christmas. Once they’re sell out they’re gone until next year! I love these cookies so much that this past year I even took a walk on the wild side and tried their dark chocolate covered peppermint joe-joe’s. Talk about gilding the lily. Yowser!!! But then the inevitable happened and I ran out. 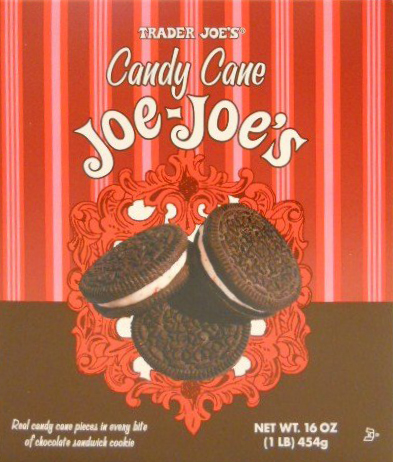 No more candy cane joe-joe’s unless I want to pay $30/box to some entrepeneur who stockpiled candy cane joe-joe’s and is selling them on Amazon or eBay. No dear readers, I will not be scalped for a box of cookies. I say no! Instead (well, after some whining and gnashing of teeth) I sucked it up and waited for candy canes to go on sale. 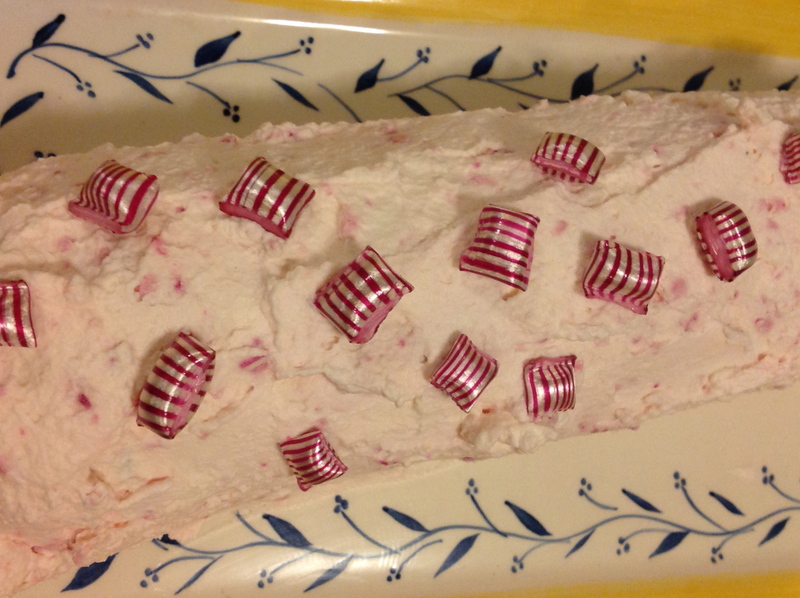 I scored a few bags of Hammond’s Pillow Peppermints at my local co-op and armed with some heavy cream and a box of chocolate wafer cookies I went about transforming Nabisco’s classic Zebra Cake into a Peppermint (not Joe-Joe’s) Zebra Cake. While it is not a candy cane joe-joe, it is pretty darn good. If you want to make this cake in its traditional long log form you’ll need a long skinny plate or platter. Whip the cream and sugar until it holds a soft peak. You don’t want to turn it into butter. I crush the peppermints by pouring them into a heavy plastic bag then bashing them with a hammer or metal spoon. Don’t do this on a wooden counter as you can leave dents. 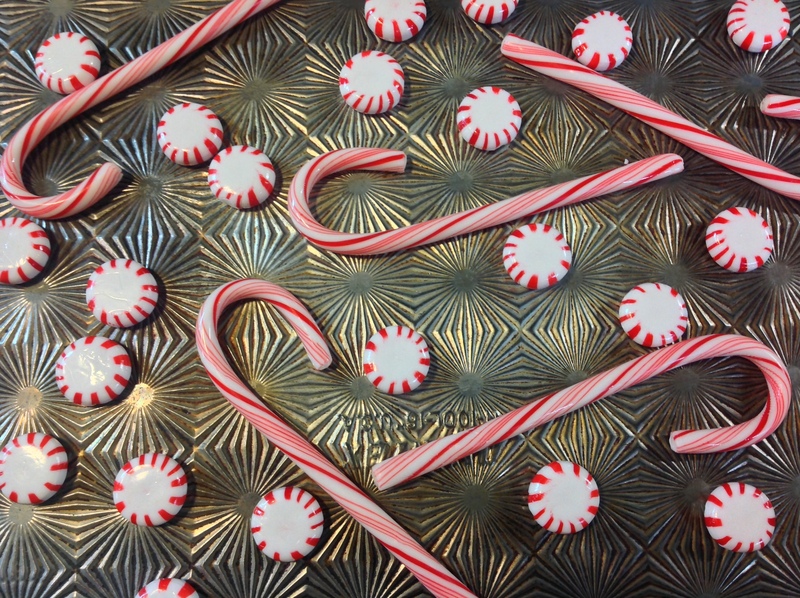 Fold in the peppermint extract and most of the crushed peppermints. 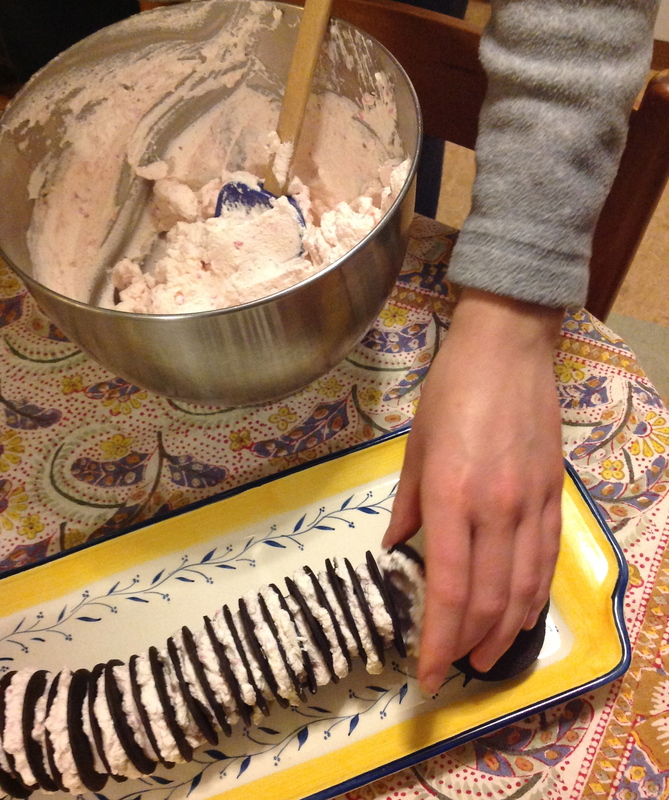 Then start layering your “cake” by spreading a heaping spoonful of whipped cream onto a chocolate wafer. When all the wafers are sandwiched together cover the entire outside with the remaining whipped cream. Sprinkle some additional peppermints on top (crushed or un-crushed if you have the Hammond pillows) and refrigerate 4-10 hours. To serve cut on the diagonal so you can see the stripes. * While I love the flavor of Hammond’s if you can’t find them or don’t want to order them you can use candy canes or peppermint starburst candies. 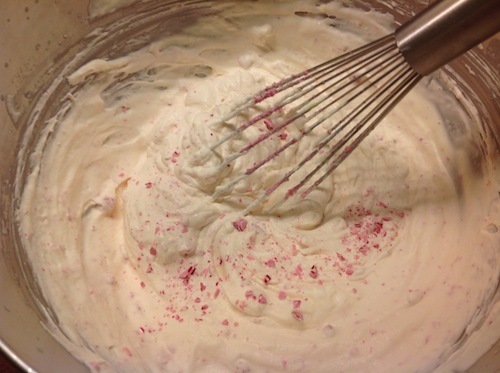 Adjust the amount you add to the whipped cream to your taste. Genius! But you should’ve posted this a little earlier in the season! This is “Refrigerator Cake.” one of the first desserts my mother ever taught me how to make. Actually, she didn’t do much teaching, she handed me the box of Nabisco Famous Wafers and told me to read the recipe on the side! She also provided a pint of heavy cream and that is how I learned to make whipped cream which was suddenly my task forevermore at family gatherings (as if whipped cream is hard to make!). I love that this is one of the first recipes you learned how to make, Leslie! It was a staple in my household growing up and it has been a family favorite ever since. Thanks for the birthday wishes Sylvie! You are right, this blog has gone well past my 50th birthday. I most definitely don’t want to stop writing it as I’ve come to love this blog so much. If I could rename it (and I probably can’t since wordpress would get cranky) it might be 50 and beyond….